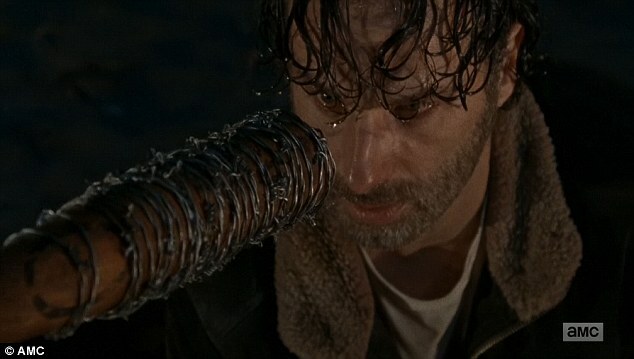 Here's how one of Negan's victims feels about his brutal death on "The Walking Dead"
If you’re one of the brave (and probably shell-shocked) people who have watched the episode, you know that Abraham and Glenn are both dead. The deaths were awful and brutal, and filming them likely was too. However, Steven Yeun, who played Glenn from the first episode of the series until now, has some surprising feelings about his character’s death which he shared on the live aftershow, Talking Dead. Fans of the comics know that Glenn is indeed the character who meets his end to Negan’s barbwire-covered baseball bat, Lucille. And while the show switched things up by having Abraham die first, then killing Glenn afterward, Yeun always knew this is how his character on the show could die. It’s definitely impactful, and while the moment in the comic is definitely scarring, it was more difficult to see it acted out, in color, with gruesome special effects. However, Glenn’s death featured a very touching moment: his telling Maggie that he’d find her. While we wish the show could have spared us Glenn being one of Negan’s victims, we do think his death was an iconic moment on the show – one that Glenn as a character, and Yeun as an actor, more than deserved.